Wada, Sanzo (1883-1967) "Kindergarten Teacher" - Woodblock - Chinese and Japanese woodblock prints for sale, silkscreen, scrolls, watercolor, lithographs. 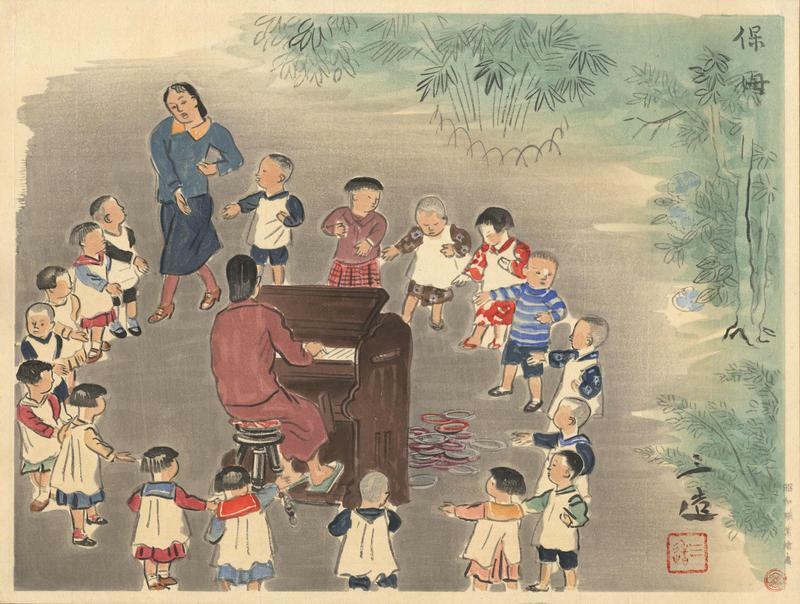 Artwork Details for Wada, Sanzo (1883-1967) "Kindergarten Teacher"
Condition: Fine. Strong embossing; Tip mounted in two places to the original series backing sheet. Notes: Limited edition of only 300 prints. This print is from the original pre-war series by the publisher Nishinomiya Shoin, not from a later post-war edition by Kyoto Hanga-In. It contains the original series title and official round red seal at the lower right corner. Artist signature and seal within the printed area.